Florist, artist and revolutionary, Joost Bakker presses pause on his renowned eco-activism to talk about his first love, native flowers. 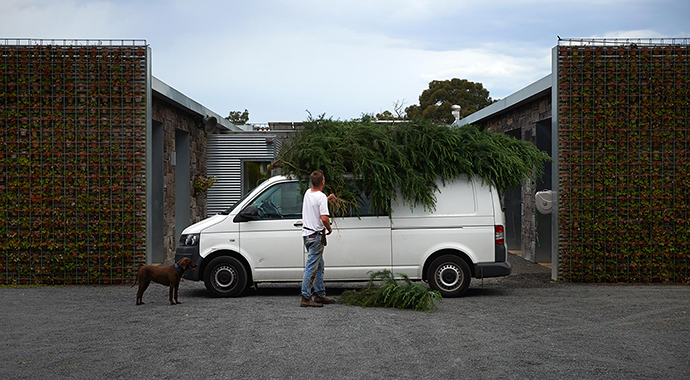 Clockwise from left: giant installations at Rock Pool restaurant; all native floral designs for a recent wedding and Joost Bakker on site at his ground-breaking Green House projects. 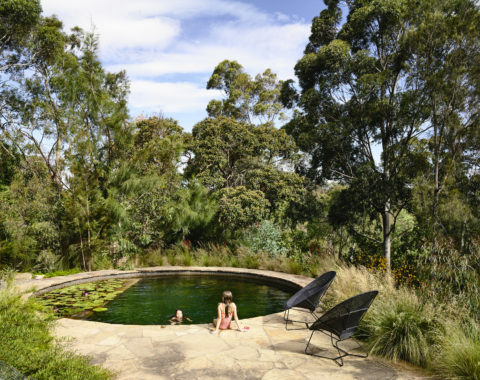 On Joost’s own property in Monbulk, near Victoria’s Dandenong Ranges, he cultivates over 300 species. The six-hectare property is where he roams and dreams wildly with his wife and business partner Jennie, their three daughters Ruby, Charlie and Remi, two German Shorthaired Pointers and several egg-laying chickens. Dutch-born Bakker has floristry in his blood. His father was a fourth-generation tulip farmer and Joost and his three brothers grew up surrounded by flowers on their property. 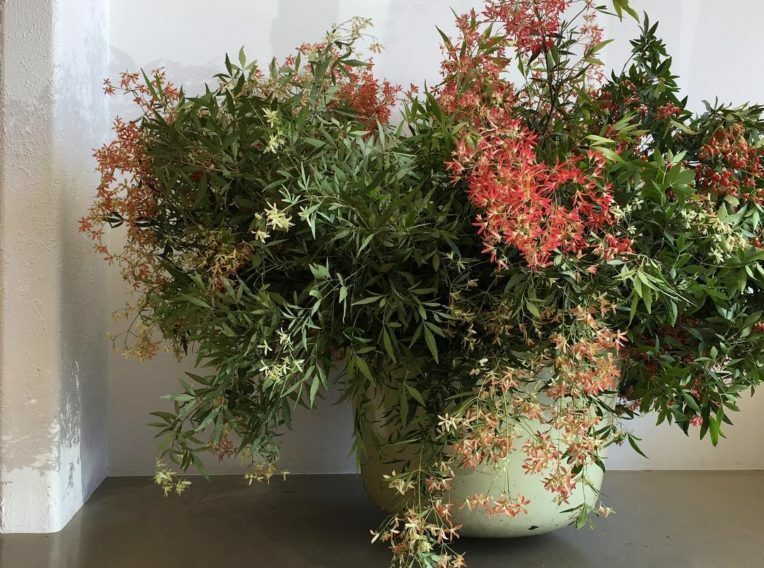 Bakker started his own floristry business in the ‘90s, choosing to use natives on large scales, arranging them with recycled receptacles such as big glass acid jars, and re-writing the ‘daggy’ image they’d accumulated in the ‘80s. “When I started using them people saw them in a new light I suppose,” he muses. “My style is quite loose. I don’t imitate nature. I don’t try and recreate a plant. 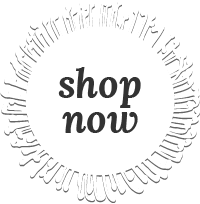 My designs are deliberately human-made.” By 2005 Bakker was designing abstract and eco-savvy floral installations for premium marquees at Melbourne Cup. With good soil and plant-matter always on Bakker’s brain, by the 2000’s he began combining floral-artistry with investigations in environmental activism and eco-entrepreneurialism. 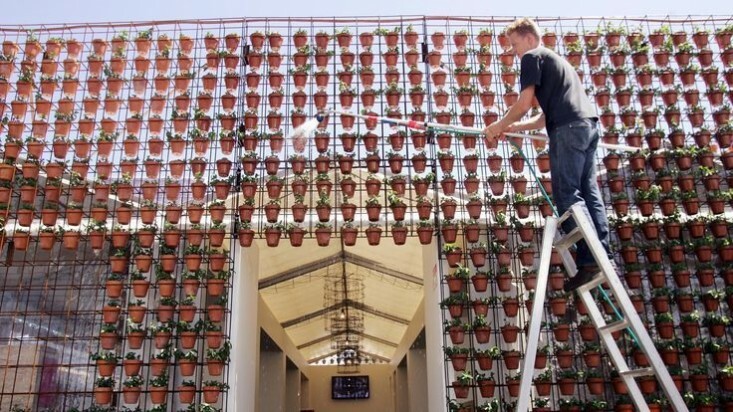 His first Greenhouse by Joost ‘living’ restaurant project popped-up in 2008 in Melbourne’s Federation Square with iterations in Sydney and Perth following. 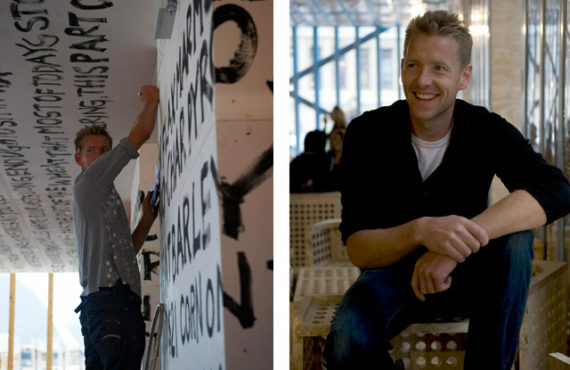 In 2012 he opened Australia’s first zero-free restaurant, Silo, later morphing it into Brothl, a broth-kitchen, with a closed-loop composting system. Building on those earlier visions, Bakker has continued to campaign for sustainable, bio-favourable design and living, but in the last decade, several large-scale design projects have stalled or been cancelled on account of unsympathetic bureaucracy. 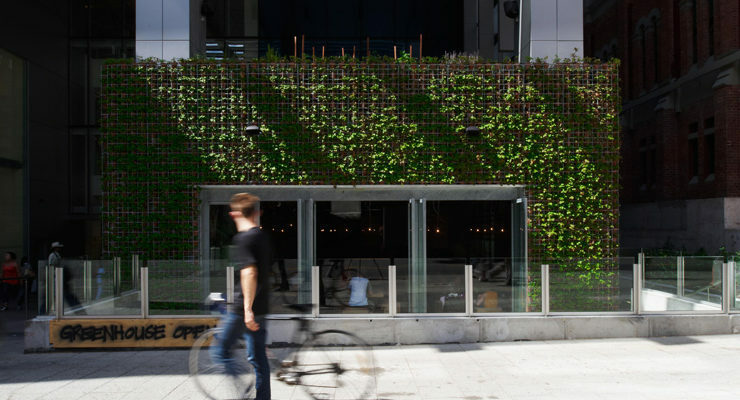 Joost’s ‘Green House’ eco-restaurant creation in Perth; installing a green wall for Macqaurie Bank. 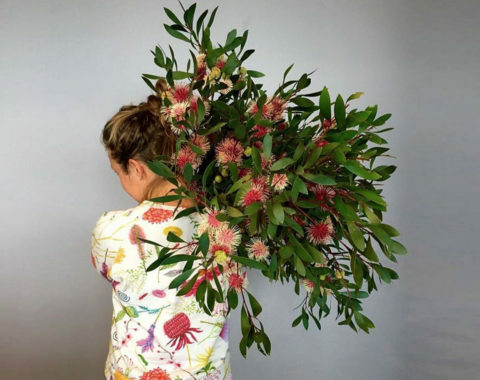 Despite his frustrations around those lost projects, Bakker continues to concentrate on his floristry, even more in love with Australian natives than when he first discovered them as a nine-year-old boy. He now grows native varieties such as various wattles and eucalypts amongst on his property, adding to his collection each year. 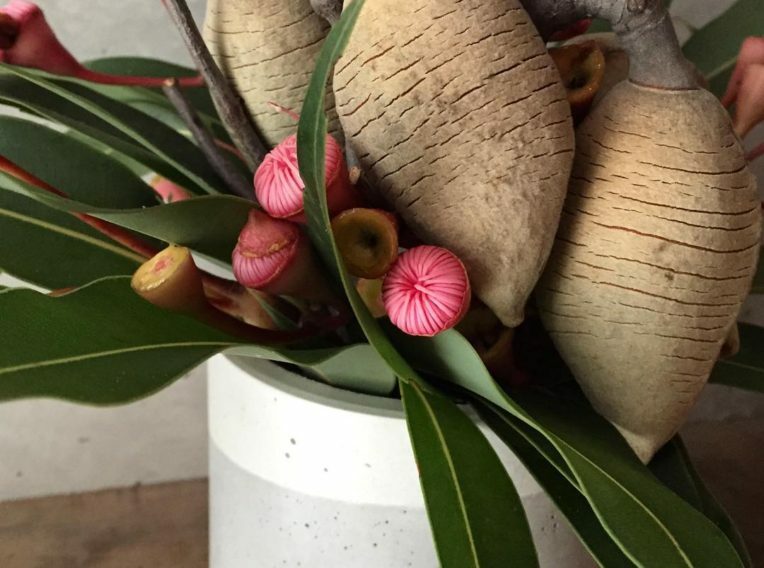 All native floral designs for the Australian Noma restaurant were a perfect compliment to Redzepi’s menu created exclusively with native Australian ingredients. 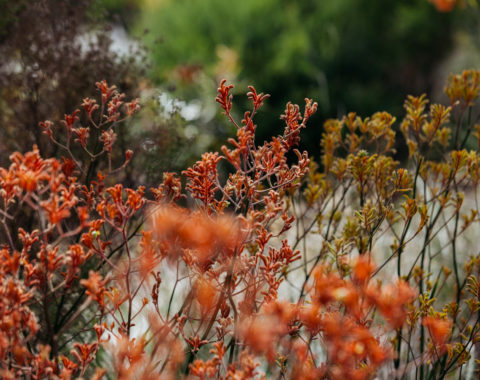 Given Joost’s environmental leanings, native plants fits particularly well into his sustainable ethos. “Crop growing almost always has a detrimental effect on the environment, whether you’re growing tulips, lilians, chrysanthemums, or carrots. It doesn’t matter what you grow. When you hoe the soil for carrots and fertilise and spray, you’re killing the worms and the microflora in the soil. Natives are one of the few crops that you plant and you’re actually encouraging biodiversity. Bakker has hundreds of native plants at his own property, all flowering at different times, with varying perfumes. A career highlight was working with renowned chef René Redzepi at the 2016 Sydney instalment of his Copenhagen restaurant, Noma, frequently cited as the world’s ‘best’. 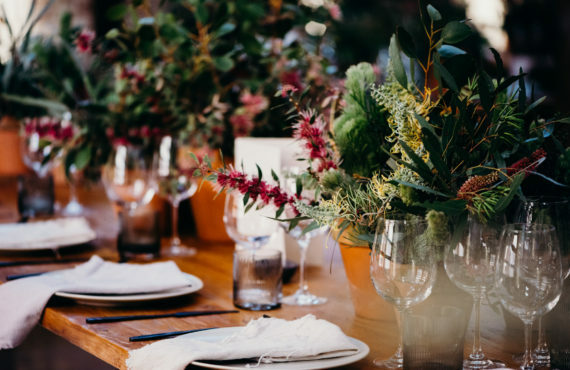 Redzepi’s menu was created exclusively with native Australian ingredients, and Bakker’s floral designs were the perfect native compliment. Inspired by the regenerative capabilities of Australian botany, specifically its ability to regenerate, thrive and germinate after bush fire, Bakker found various hakea seed pods, burnt and charred them, then mixed them with fresh eucalypt flowers, grevillea and wattles. 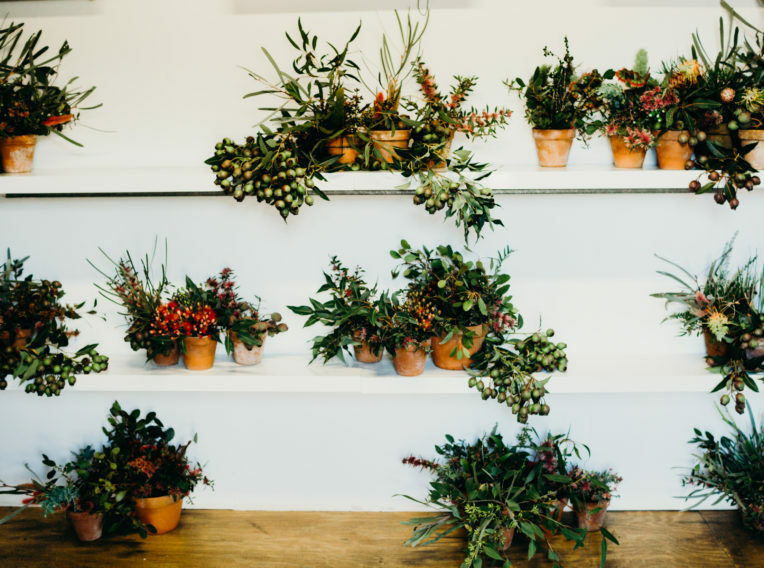 “I picked everything here in Victoria, drove up and did the opening, then guided local florists on how to do the rest,” Bakker recalls. 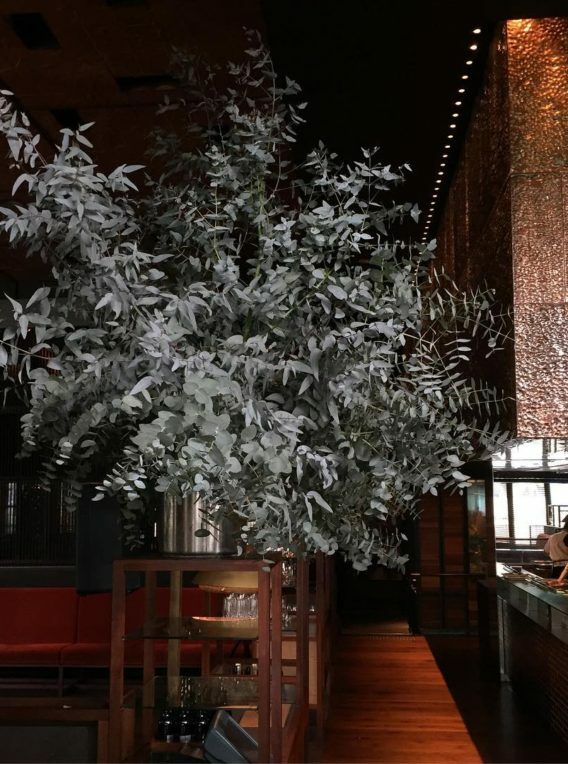 There were also two large native grass trees planted into the sunken floor of Noma’s dining room, relocated by the architects after the pop-up project finished.